Because of the growing chemical and geological diversity of the new oils, the lack of alternative liquid fuels for transportation, and the size and global scope of oil production and trade, a tax is most needed in the oil sector. Regulation and government funding of R&D are necessary but not sufficient to slow climate change. To transform energy use and supply across the economy, greenhouse gas (GHG) emissions will have to be priced and the power of the market brought to bear. Oil is the most demanding fossil fuel in this regard. It is largely used for a single purpose—transportation—for which it has few substitutes. It is the most diverse of all fuels—chemically, geologically, and geographically. And it is heavily capitalized and the most traded global commodity. Each characteristic makes the design of an effective and fair tax particularly difficult. Moreover, the United States faces a hydrocarbon landscape transformed by new, unconventional oils. The long-standing expectation of a gradual, shortage-driven shift to clean fuels has been replaced by the need for a swift transformation in the face of abundant supply. National policy making has not begun to catch up. A new smart tax design offers a way to do so. Traditional tax designs are blunt instruments that treat all oils alike and tax only consumption of end products. Blunt taxes leave major unconventional oil emissions untaxed, treat dirtier oils more favorably than cleaner ones, provide no incentive for technological innovation, and offer no incentive for refiners to consider climate in determining product mix. For the first time it is possible to quantify the amount and profile of GHG emissions from all oils throughout the supply chain using the Oil-Climate Index developed by researchers at the Carnegie Endowment for International Peace, Stanford University, and the University of Calgary, allowing replacement of blunt taxes with a smart tax design. A smart tax differentiates among the chemical entities called “oil,” accounts for GHG emissions along the entire oil supply chain, and includes byproducts that do not fuel transport, thereby correcting the shortcomings of a blunt tax. A smart tax can be simply administered at the refinery level, allowing refiners to pass the charges up the supply chain to producers and crude transporters and down to product transporters and consumers in a mechanism comparable to netback pricing. A means of applying border tax adjustments will be necessary. A range of new data must be standardized, collected, and made available, and a lead government agency made responsible for the task. Political barriers to enactment can be lowered by making the smart tax revenue neutral with a formula for returning revenues to the economy that is simple, transparent to the public, and equally attractive to both major political parties. At the Paris climate summit in December 2015, 195 nations committed themselves to transform the world to a low-carbon economy through steep reductions in greenhouse gas emissions over the coming few decades.1 Keeping the world’s average warming to the goal of 2 degrees or less above pre-industrial levels will require sweeping change across rich and poor economies in a very short space of time.2 The task is enormous and will entail transforming virtually all areas of energy use and supply. Also, oil is massively capitalized and is the world’s most traded commodity.6 The enormous sunk costs in oil production and the global web of extraction, transport, refining, and use make it hard for any single country to push this huge, integrated industry in new directions. The price signal, important to controlling emissions from all sources of energy, is vital in the case of oil. Finally, oil is by far the most diverse of all fuels—ranging from light mixtures of liquids and gas to solid, heavy bitumen and kerogen, differing profoundly in their chemistries and in the refined products they produce. Oils come from a wide range of regions, are buried in very different kinds of geologic deposits, and require an array of complex technologies to extract and refine them before reaching consumers. This great diversity limits the applicability of regulatory and technological approaches to cutting emissions from oil. Each of these characteristics makes the price signal, important to controlling emissions from all sources of energy, vital in the case of oil. Regulation and the development of new technology can be effective in the absence of a clear price signal, but both are far more effective if they work in step with market forces, rather than separate from or even against them. Government can pay for R&D, for example, pushing new technologies into the marketplace, but the flow of innovation will be stronger and faster if demand from the market makes commercial investment in new technology attractive, pulling those technologies into use. For simplicity and ease of recognition, we use the shorthand term “carbon tax” throughout to signify a tax on all GHG emissions. The GHGs considered here and in the Oil-Climate Index include carbon dioxide (CO2), methane (CH4), and nitrous oxide (N2O). The emission figures referenced in this report are carbon dioxide equivalent (CO2e) emissions that are calculated using the global warming potential (GWP) with one-hundred-year warming and climate feedback. The GWP represents the combined effect of the differing times these substances remain in the atmosphere and their effectiveness in causing radiative forcing. GWPs for each greenhouse gas are CO2 = 1, CH4 = 34, and N2O = 298. Other GHGs emitted through the supply chain (for example, black carbon) exist, but they can be difficult to quantify and have not been included here. Similarly, the term “carbon pricing” means pricing of all content that produces GHGs. For more information see: Gunnar Myhre et al., “Anthropogenic and Natural Radiative Forcing,” in Climate Change 2013: The Physical Science Basis. Contribution of Working Group I to the Fifth Assessment Report of the Intergovernmental Panel on Climate Change, eds. Thomas F. Stocker et al. (Cambridge, UK: Cambridge University Press, 2013), https://www.ipcc.ch/pdf/assessment-report/ar5/wg1/drafts/WG1AR5_SOD_Ch08_All_Final.pdf. For details, see Table 8.7. A carbon tax is best designed expressly for oil because crude oil and petroleum products are so different from other energy sources—in their chemical diversity, their long international supply chains, their processing complexities, the value that causes them to trade at an economic premium, and the lack of ready substitutes. This is not to suggest that pricing carbon in other fuels is not also called for, only that oil presents a suite of unique challenges and opportunities. The question to which this analysis is addressed is whether a workable carbon tax or fee can be designed that will account for oil’s chemical, geologic, economic, and geopolitical features. Ultimately, of course, the challenge is a global one, but as the Paris approach wisely recognized, the steps along the path to a safe climate will be designed and introduced country by country. Accordingly, the focus here is on the United States, one of the world’s largest users, producers, and refiners of oil; the second-largest emitter of greenhouse gases; and, at least potentially, a natural leader in the effort to keep the planet’s climate within safe bounds. For nearly a half century, Americans have believed that affordable oil would become increasingly scarce and have worried about the degree of U.S. reliance on foreign sources of it.8 The call for energy independence—a feature of campaign rhetoric for decades—has not been about energy in general, but about oil. Since the Organization of the Petroleum Exporting Countries (OPEC) oil embargo of 1973, policymakers have accordingly focused on safeguarding the security of the U.S. supply, employing an array of strategies including automobile mileage standards to reduce demand and an ethanol mandate to provide a source of domestically produced supply. As environmental and climate considerations rose in importance, regulatory policies such as low-carbon fuel standards and zero-emission vehicle requirements were adopted to guide a gradual transition to clean, low-carbon, alternative fuels. Instead of running out of oil, however, the new millennium ushered in a paradigm-shattering change. Bolstered by surging demand, high prices, and technological breakthroughs, unconventional oils began to be produced in large volumes, including oil sands, hydraulically fractured tight oils, extra-heavy oils, ultra-deep oils, ultra-light condensates, and more. Faster than anyone believed possible, the United States left behind decades of worry over its dependence on oil imports and became a major oil producer and exporter almost overnight. The United States became a major oil producer and exporter almost overnight. Neither public understanding nor national policy has begun to catch up to this profound change. America is now confronting explosive production of an array of plentiful, little understood, still evolving, and, in some cases, environmentally damaging new oils. Old mind-sets, backed by insufficient information and outdated rules and governance structures, are struggling to adapt to a drastically altered hydrocarbon landscape. Security of supply has given way to the imperative of controlling climate change. The expectation of a gradual, shortage-driven transformation to clean fuels has been replaced by the wholly different challenge presented by the need for a swift transformation in the face of abundant supply. Neither public understanding nor national policy has begun to catch up to this profound change. The oil supply chain is responsible for significant GHG emissions beyond the combustion of its end-use petroleum products. Extracting, processing, refining, and transporting oil is energy-intensive; large energy inputs are needed, and energy is wasted in operations. When the differences in energy inputs and waste in the supply chain and the variability of types of oil are accounted for, oil-to-fuel pathways differ dramatically in their full GHG emission profiles. The Oil-Climate Index (OCI)—developed by researchers from the Carnegie Endowment for International Peace, Stanford University, and the University of Calgary—is able to quantify, for the first time, the differences in both the amount and profile of GHG emissions produced throughout the supply chain.9 Some oils generate higher emissions in their extraction and others during refining. Still others have a more GHG-intensive slate of products. In the OCI’s first sampling of oils, overall emissions vary by nearly a factor of two. The long-standing assumptions that oil is oil and that most or all of its GHG emissions occur when its end products are burned are simply wrong, as the examples shown in figure 1 make abundantly clear. Yet, both of these assumptions have shaped the design of virtually all oil taxes proposed over the past several decades. We call these measures blunt taxes. They are of two types. One type treats all barrels of oil alike through a flat fee based most commonly on volume (a per barrel tax) or energy content (a BTU tax). This made sense when barrels of crude oil were very similar. It no longer makes sense when a barrel of crude could be anything from ultra-light condensate to semisolid bitumen. The other type of blunt tax addresses only the end products of oil use—most often gasoline (a gas tax). This puts the entire burden of reducing GHG emissions from oil on consumers, thereby removing any incentive for producers, refiners, and transporters to reduce their own emissions. Targeting only consumers of end products would indeed dampen oil demand, but would do so at a needlessly high cost and with many unwanted effects. Many oils have significant amounts of associated natural gas trapped with them in reservoirs. If this gas is not collected and sold upstream but is instead flared or vented, GHG emissions from upstream production make up a large share of each barrel’s much larger total emissions. The particular light, high-flare oil example shown in figure 1 produces 35 percent more emissions per barrel than light oil that is not flared, even though the high-flare oil generates emission credits when some of the associated gas is used for export and to produce electricity consumed in the oil’s production. Depleted oil fields have generally been producing for several decades. The oil extracted from them is often heavier, more viscous, and more water-saturated than oil from younger fields. Pressure at the wellhead is often diminished in a depleted field, hampering its flow. Depleted oils therefore often require large energy inputs to produce steam, which reduces the oil’s viscosity to help force it out of the ground, and to run pumps to induce its flow and remove entrained water. The carbon-heavy, depleted oil requires the production and addition of hydrogen to convert the carbon contained in heavier oils into valuable petroleum products, which increases the emission intensity of midstream refining. Climate policies must be designed to accommodate differences in oil resources and engineering processes with their attendant variance in GHG emissions. The most emissions-intensive oil depicted in the figure, an extra-heavy oil, requires a physical and chemical transformation to make it flow more like a conventional crude and convert it into petroleum products. Different pathways for such conversion are currently in use and under development. For example, upgrading is an energy-intensive upstream process that removes the oil’s excess carbon to produce a synthetic crude oil along with the byproduct, petroleum coke (or petcoke, a solid fuel that is high in sulfur and other contaminants and used for power generation). When petcoke is combusted, its climate and air-quality impacts can be even greater than coal’s. Another such process involves diluting the extra-heavy oil with lighter hydrocarbons to make the oil flow to a refinery where hydrogen is added and excess carbon is removed. Depending on future oil demand, these already large differences among oil types could widen substantially as advances in technology create ways to extract and transform new sources of hydrocarbons. Climate policies must be designed to accommodate these differences in oil resources and engineering processes with their attendant variance in GHG emissions. It must account for GHG emissions along the entire oil supply chain: production, refining, transport, and end product use. It must include the emissions from oil byproducts that do not fuel the transport sector, the most important of which is the bottom-of-the-barrel material known as petcoke (which is sold, exported, and burned, but is classified and is often used as a solid fuel to blend with or displace coal). Figure 2 reveals the dimensions of this shortcoming. The OCI results of four U.S. oils (including both flaring and no-flaring scenarios in Texas’s Eagle Ford condensate formation) are used as proxies to illustrate the range of possibilities. A blunt tax applied to only combusted end products leaves 9–38 percent of emissions untaxed. In the case of Midway Sunset—a depleted, heavy oil from California—over one-half of the emissions are untaxed if petcoke is not counted. Oil production and refining are highly competitive activities, often operating with small profit margins. A small change in price can make a big difference in operations. Innovation and greater efficiencies are always being sought in this constantly evolving industry. A tax should encourage and reward technological advances that reduce GHG emissions. An example would be the incentive to develop cost-effective processes for collecting and using any associated gas that is now flared. Figure 2 shows that, if only end product combustion is taxed, flaring its associated natural gas improves the Eagle Ford condensate’s competitive position compared to safely managing its associated gas by leaving 37 percent of total emissions untaxed rather than 9 percent. Other examples of innovations for dealing with depleted and extra-heavy oils are illustrated in the Oil-Climate Index. For example, the same California Midway Sunset oil illustrated in figure 2 requires process heat to generate the steam needed for its production. The necessary energy could come from a fossil fuel, or it could be generated from concentrated solar energy. A blunt oil tax would penalize that step forward. Discouraging innovation in this way is, of course, the very last thing a climate control policy should do. Important petroleum products—including petcoke, residual fuel oils, petrochemical feedstocks, and asphalt—fall outside the traditional boundaries for liquid transport fuels. But the emissions from their use are equally relevant to what matters: the amount of GHGs in the atmosphere. Petcoke is the most important of these ancillary petroleum products. If this very high carbon, solid, oil byproduct were not included, approximately 25 percent of total emissions from extra-heavy oils would go untaxed, as highlighted in figure 4. A smart carbon tax on oil must give refiners reasons to consider climate in determining their product mix. A smart tax creates the necessary incentives; a blunt tax does not. Because oil demand is relatively inelastic, with few ready substitutes, a blunt tax that charges only end product consumers would likely necessitate a much higher tax rate in order to achieve a given level of emission reduction. Moreover, assessing the tax on all stakeholders in the supply chain—producers, transporters, refiners, and consumers—greatly expands the opportunities for cost-effective emission reductions. Refiners know oil. In order to process crude into products, they need to accurately characterize it, both chemically and physically. And because they can procure crude oils from a wide array of producers, refiners have leverage over those from whom they choose to buy. The price they charge is based on the crude’s quality and its transport costs (known as netback pricing). This amounts to the same variable pricing mechanism that would be applied through a smart tax. Refiners can include in netback pricing the upstream carbon tax—the amount determined by the GHG emissions of upstream operations including, for example, the flaring and venting of associated gas. Imported oil can be managed through the same mechanism. Foreign producers would either have to provide the information needed for U.S. refiners to determine the amount of the upstream tax or refiners would take their business elsewhere. Refiners would be directly responsible for the portion of GHG emissions they generate in their operations. Finally, they would pass down to consumers that portion of the tax attributed to combusting each end product. The administrative burdens of a smart carbon tax would pale in comparison to many other common taxes. Assessing the full tax on producers is far less feasible than placing it on U.S. refiners. To do so, assumptions will have to be made with regard to the refinery in which the oil is destined to be processed, the particular refining units through which it will be passed, and the final slate of products that will be produced. In cases where certain oils have consistently been sent to a single, easily characterized refinery, reasonable life-cycle emission extrapolations can be made at the point of extraction. But in most cases, these assumptions are likely to be rough and inaccurate. A tax is then vulnerable to exploitation and arbitrage by those who understand how to use such assumptions to their advantage, to the ultimate detriment of the policy’s intended purpose. Crude oil and petroleum products are highly mobile commodities. Crude produced in one country can be transported to other countries to be refined, with those products transported again, over long distances, to be consumed in many other countries. Thus, until or unless a uniform price on carbon is adopted worldwide, countries that choose to use the market will also have to consider the use of border tax adjustments in order to avoid a loss of competitiveness if oil production and/or manufacturing enterprises move to countries that do not charge a carbon tax. These adjustments at the border are also needed to prevent some emissions from escaping taxation entirely. When it comes to meeting the emission reduction pledges made at the Paris summit, a country’s responsibility to cut GHGs will depend on where along the supply chain it takes control of crude oil or petroleum products. In the parsing of oil sector GHGs, multiple INDCs could be involved depending on the country in which an oil and its products are produced, refined, and consumed. As countries report on their current INDCs and revise future INDCs, they will want to think strategically about what types of domestic and foreign oil resources they choose to utilize and how they account for their particular GHG emission responsibilities. The case of Canadian oil sands exported to a U.S. refinery offers an example of the implications of this approach to allocation. There are many pathways to convert these bituminous resources into usable products, and more are under development. Depending on the method chosen, Canada’s obligation could change dramatically, as illustrated in figure 5. In the case where the United States has a carbon tax that properly accounts for all emissions and Canada does not, different oil sands pathways are materially different in financial terms. If Canada opted to upgrade its oil sands, stripping off the excess carbon in Alberta, it would then ship synthetic crude oil to the United States and would retain possession of the petcoke byproduct. In this case, Canadian producers would pay a carbon tax of $6 per barrel, and U.S. refiners would pay $9 per barrel, a $3 difference. However, if Canadian producers shipped diluted bitumen (dilbit) to U.S. refineries—which then converted the bitumen and produced the petcoke—Canada’s carbon tax responsibility would be substantially reduced in absolute terms and shifted to the United States, whereby Canadian producers would pay $3 per barrel and U.S. refiners would pay $11 per barrel, an $8 difference. Thus, the gap in the taxes assigned to the two countries differs significantly for the same oil resource depending on where in the supply chain emissions occur. Countries, therefore, will have to be mindful of the sources of emissions in order to accurately parse their climate responsibilities. Of course, if Canada (or any other nation) also enacted a smart carbon tax, it could readily impose the tax on its portion of emissions, avoiding the need for border tax adjustments entirely. The United States’ oil imports are currently considerably simpler than one might expect. In 2015, 56 percent of U.S. crude supplies through the third quarter were produced domestically, as shown in figure 6. An additional nearly 4 million barrels a day came from within North America—three-quarters from Canada and the rest from Mexico. Thus, at present, approximately 80 percent of the U.S. oil supply comes from the North American continent. While some of this concentration may be the result of various U.S. crude trade restrictions that were lifted at the end of 2015, it nonetheless highlights the enormous opportunity that could be seized by harmonizing the energy-climate policies of the three North American neighbors. It also underscores that the United States need not assemble data on every oil in the world when developing a smart tax. Essentially all of the remaining 20 percent of oil currently imported into the United States comes from only seven nations outside North America. Thus, the starting point for assembling data needed to underpin a smart carbon tax for oil in the United States is eminently manageable. While over one-third of U.S. petroleum products are currently sold to Canada and Mexico, the remaining share of exports has a far wider geographic reach than U.S. crude oil imports, as shown in figure 7. Again the fact that the United States exports significant volumes of petroleum products to at least 30 other countries is an artifact of a historical asymmetry between the treatment of U.S. crude oil and petroleum product exports that has since been equalized. The climate footprints of these products vary widely, with the largest being for petcoke and residual fuel oil. As of the end of 2015, petroleum products accounted for nearly all of the 5 million barrels per day of U.S. oil exports (only an average of 500,000 barrels a day of crude was exported in 2015 under certain exemptions allowed under the crude export ban). The majority of U.S. petroleum product exports were diesel fuel (27 percent), natural gas liquid feedstocks (23 percent), petroleum coke (12 percent), and residual fuel oil (6 percent). 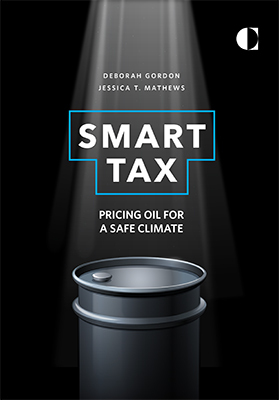 When it comes to implementing a smart carbon tax for oil, policy must account for this highly globalized market, including the future evolution of trade flows of crude oil and petroleum products. Experts disagree over how effectively the United States or any other country could act either unilaterally, in a “club” of countries representing a critical mass of global trade or global gross domestic product,16 or only through an internationally negotiated arrangement. The disagreement stems from varying expectations of how countries would respond to others’ border tax adjustments, including the likelihood of a trade war in the World Trade Organization (WTO) and beyond. There are huge opportunities from harmonizing U.S., Canadian and Mexican energy-climate policies. Border adjustments could give firms rebates for exports of petroleum products in the amount of emissions that had been taxed but not yet realized through combustion. Or, border adjustments could impose tariffs on imported oil or petroleum products to account for the embodied emissions that go untaxed abroad. Legal scholars and some WTO officials believe that a carbon tax accompanied by a border adjustment could be designed to be compliant with WTO rules, analogous to WTO-permissible value-added tax border adjustments.17 The most significant challenge will likely relate to proving that various crude oils (and/or different petroleum products produced from different feedstocks and processes) are not “like” products under WTO law.18 A sound scientific and regulatory basis to establish that different oils are materially different under the standards of trade law will require a more comprehensive and more transparent collection of global data covering the entire oil supply chain. With or without a carbon price, the successful reduction of GHG emissions absolutely depends on accurate and transparent monitoring, reporting, and verification of national and sectoral emissions. This is true for all fossil fuels. Oil poses a particularly stiff challenge, however, since emissions vary so widely by oil type, by reservoir, by process, by company, and by country. These differences will likely increase over time due to technological improvements, operational decisions, demand shifts, and new resources entering the marketplace, underscoring the need for a durable protocol for routinely reassessing emissions. An essential element of a smart tax, therefore, is standardized, open-source, and regularly updated data. Oil is a massive global enterprise that is highly dynamic and requires an enormous amount of information to function. At present, however, too few of these data are publicly available in verifiable and consistent form. Oil databases are sold as commercial products, but the price tag is extremely high, the data may not be independently verifiable, and the metrics needed to calculate climate impacts are often not included. In the United States, the Environmental Protection Agency (EPA) is responsible for assembling a GHG emission inventory through the Greenhouse Gas Reporting Program established in 2010.19 However, this database has significant shortcomings. The reporting program provides facility-level data for large sources of direct emissions, which only counts about one-half of all U.S. emissions. There is some degree of standardization, but reporting is voluntary and different formats are allowed. Oil and gas operations are combined into a single sector in the database, which can make it difficult to parse oil sector emissions, and can introduce potentially large errors. For example, the EPA estimates that upstream oil production emissions in the Bakken formation account for over 8 MMT of carbon dioxide equivalent emissions.20 The more detailed OCI estimates, however, calculate upstream emissions to be 25 MMT from Bakken production—a threefold difference. This high degree of undercounting is also evident in California production. These discrepancies raise concerns about GHG inventories in the refining sector as well. oil market data (origins, destinations, volumes, and modes for crude and petroleum product transport along with oil sector economic market pricing), especially for bottom-of-the-barrel residual fuels that are high in GHG emissions. Some of this information is already available and published in academic journals, in industry publications, and on companies’ websites. Oil resource characteristics are not trade secrets; they are typically advertised when marketing crudes worldwide. Oil field details are the subject of ongoing study in academia and oil consulting practices, and they are often openly published. Engineering equipment and process specifications, however, are often developed at the company level and may cross the line into the realm of valuable trade secrets. On balance, the oil industry stands to benefit from making basic oil field data available because it must innovate to survive. Hydraulic fracturing and horizontal drilling that can access tight oil deposits in shale came about because government, academic, and industry research was conducted on data made available on tight reservoirs, which led to eventual breakthroughs. Conversely, the lack of consistent, verifiable data creates blind spots for industry. And, the more open-source the data from industry, the greater the pressure will be on nationalized oil companies to provide similar transparency. There is currently no clear assignment of responsibility for data collection in the United States government. The EPA maintains a national GHG inventory, but these data have the limitations discussed above. The Energy Information Administration (EIA) in the Department of Energy analyzes data that industry provides, but there are strict limitations imposed on its ability to add new reporting requirements. The Department of Energy does not have standardized mechanisms to monitor the various processes in the domestic oil supply chain, although several of its national laboratories analyze new oil pathways and their GHG impacts. The same is true of the Department of State when it comes to the international oil supply chain, although its Bureau of Energy Resources may have the most up-to-date information on oil operations of other nations that supply the United States. The U.S. Geological Survey produces data on oil field resource volumes and other characteristics that, if standardized, could provide valuable inputs for estimating oil-climate impacts. If a carbon tax were established, the Department of the Treasury would also be involved. The maze of overlapping but incomplete data-collection roles has to be sorted out so that no key responsibilities fall through the cracks. Clearly, this maze of overlapping but incomplete roles has to be sorted out so that no key responsibilities fall through the cracks. Designating a lead agency or entity for data collection and management is a top priority for successful climate control in the United States. The EIA may be the most suitable agency to take on this lead role. Once the large number of oils in current production is cataloged, it will be a matter of routinely updating these data. Then, as new oil prospects go through the permitting process under the National Environmental Policy Act, oil data will be routinely collected as a part of environmental impact reporting at the outset. Finally, it will be vital to track and account for bottom-of-the-barrel residual byproducts used outside the transport sector. These include petcoke, heavy fuel oils, and other climate-intensive residuals. U.S. exports of these byproducts to China, India, Japan, and other Asian markets have been increasing in recent years as the United States refines more extra-heavy oils.25 China is just beginning to track petcoke imports and combustion in order to reduce its severe air pollution.26 These emissions must be accurately reflected in national oil sector emission inventories. As the International Energy Agency has noted, the use of coke in blast furnaces or other industrial uses can lead to confusion, omission, or double counting of coke emissions in both energy and industrial processes.27 But with the potential for petcoke production to rise as heavier oils are brought to market, it will be critical to address this issue head-on. It is by no means assured that the United States will be able to fulfill its pledge to cut GHG emissions by 26–28 percent below 2005 levels in just nine years. Legal challenges to measures that have been counted on for needed cuts pose a substantial uncertainty. Low oil prices encourage consumption, making the task even harder. The absence of a national consensus that rapidly changing climate caused by human actions is a threat that must be met is a continuing bar to success. And this challenge is just the beginning. Even complete fulfillment of the Paris pledges by all countries would not be enough to safeguard the climate.28 Transformative as they are, the pledges that have been made are only a first step. Notwithstanding the size of the cuts in emissions that will be needed, the measures the United States has taken to date, as well as those that are planned, are notably incomplete. They have relied on only two of the three types of policy levers to steer change: regulation and funding of R&D on new energy technologies. Arguably the most direct and most powerful of the three—price—has so far not been put to work at the national level. And with regard to oil—accounting for 36 percent of U.S. energy use—efforts have narrowly focused on reducing demand, putting most of the burden on motorists through the Corporate Average Fuel Economy (CAFE) mileage standards. CAFE has been a striking success and can achieve more, but it is particularly vulnerable to price swings in the oil market. In 2015, with oil prices having fallen dramatically, American buyers chose low-mileage pickup trucks, heavy sport utility vehicles, and crossover models for more than half (57 percent) of their new purchases.29 Those decisions have long tails: the record-setting 17.5 million new vehicles sold in the United States in that year will be in service for well over a decade. A price on GHGs will send a vital signal, erasing, as nothing else can, the lingering uncertainty that holds back commercial investments and consumer choices of low- GHG, high-efficiency energy. To make the cuts in emissions that are needed now, the United States—and the rest of the world—must address oil supply as well as use. Policies must be able to direct production to those resources with the lightest climate footprint and to stimulate innovation throughout oil’s supply chain. Only a smart tax provides the means to do so. Success requires harnessing the power of the marketplace. Trying to transform both supply and demand broadly across the whole economy without putting a realistic cost on GHG emissions’ contribution to climate change is to work with not one arm, but several limbs, tied behind the nation’s back. In addition to its direct effects on emissions, a price on GHGs will send a vital signal, erasing, as nothing else can, the lingering uncertainty that holds back commercial investments and consumer choices of low-GHG, high-efficiency energy. A smart tax, in particular, will also act as a force multiplier of regulatory and R&D measures already in place. As figure 8 illustrates, a smart tax coupled with CAFE standards that result in low-GHG oils used in low-GHG cars leads to a fourfold reduction in emissions, doubling the impact of the standards alone. But climate progress will backslide with a blunt tax that does not distinguish among oils and that results in high-GHG oils being used to fuel inefficient sport utility vehicles. Notwithstanding these large returns, adopting a carbon tax on oil—like any tax—will be a heavy political lift. To make it feasible, the tax must be a smart one, able to produce the greatest returns in emission cuts with the greatest efficiency and at the least cost. It will require that new oil data reporting requirements be established so that all emissions can be fairly taxed and so that the climate impacts of prospective resources can be modeled through an open-source tool like the OCI before investment decisions are made. Political, as well as economic, considerations argue strongly that the tax or fee be revenue neutral: that is, that all of its revenues are immediately and directly returned to the economy. Revenue neutrality has two great advantages. It minimizes the impacts of the tax beyond the targets at which it is aimed. And, it will greatly ease the path to enactment. Once opened to the political process, the lure of the tens of billions in potential revenue from a carbon tax will set off an unending contest for shares of its proceeds. There are any number of deserving purposes to which these could be put. Each of them has fierce proponents, many with large sums to spend on lobbying for their desired outcome. Only the discipline of a fixed boundary can avoid sinking the measure in a sea of competing priorities. While revenue neutrality avoids one set of political battles, a closely related one remains in the matter of how the revenues are returned to the economy and to whom. There are an almost infinite number of possibilities. In our view, whatever formula is adopted must meet two criteria: it must be simple and transparent to the American public, and it must be equally attractive to both political parties. This standard would be met, for example, by allocating the revenues to just two purposes—cutting the corporate income tax to stimulate economic growth, and preventing any worsening of economic inequality by reimbursing poor and middle-income families for the added cost of their oil. The massive shifts that must take place to meet the Paris pledges and eventually to decarbonize the U.S. economy simply cannot happen without the guiding signal of prices that reflect the true costs of hydrocarbon combustion. Only a steady price signal can cause all actors—energy producers, refiners, manufacturers, scientists, entrepreneurs, policymakers, and consumers—to face in the same direction, planning for the same future. Because of the growing chemical and geological diversity of the new oils, the lack of alternative liquid fuels for transportation, and the size and global scope of oil production and trade, a tax is most needed in the oil sector. Blunt taxes, however, will miss as much as half of many oils’ emissions and will steer the market toward dirtier (in climate terms) resources and processes over cleaner ones. Nor can such measures stimulate the needed innovations along the supply chain. Making the tax a smart one will make a huge difference to the health of the U.S. economy as well as to the success of the climate control effort. 1 United Nations Framework Convention on Climate Change, “Adoption of the Paris Agreement,” December 12, 2015, http://unfccc.int/resource/docs/2015/cop21/eng/l09r01.pdf. 2 Two degrees Celsius is the commonly referred to temperature rise that the Intergovernmental Panel on Climate Change referenced in its fifth assessment report in order to quantify the limit of carbon dioxide emissions that can be emitted before crossing an agreed upon safety threshold. See: Intergovernmental Panel on Climate Change, “Summary for Policymakers,” in Climate Change 2014 Synthesis Report (Geneva: Intergovernmental Panel on Climate Change, 2014), https://www.ipcc.ch/pdf/assessment-report/ar5/syr/AR5_SYR_FINAL_SPM.pdf. 3 The INDCs were formalized at the Paris climate conference and are now referred to as NDCs, or nationally determined contributions. 4 U.S. Energy Information Administration, “Energy Consumption by Primary Fuel,” in Annual Energy Outlook 2015 (Washington, DC: U.S. Energy Information Administration, April 2015), figure 18, http://www.eia.gov/forecasts/aeo/section_energyconsump.cfm. 5 World Bank, “Putting a Price on Carbon with a Tax,” June 3, 2014, http://www.worldbank.org/content/dam/Worldbank/document/SDN/background-note_carbon-tax.pdf. 6 Chou Hui Hong, “Goldman Sees LNG as Biggest Commodity After Crude This Year,” Bloomberg, March 4, 2015, http://www.bloomberg.com/news/articles/2015-03-05/goldman-sees-lng-topping-iron-ore-with-120-billion-annual-trade. 7 See, for example: Carbon Pricing Leadership’s homepage, accessed April 5, 2016, http://www.carbonpricingleadership.org/; World Bank, “Carbon Pricing: It’s on the Move,” November 30, 2015, http://www.worldbank.org/en/news/feature/2015/11/30/carbon-pricing-its-on-the-move; Paul Carrel, “IMF’s Lagarde Calls for ‘Wise’ Taxes to Foster Greener Fuels,” Reuters, December 7, 2015, http://www.reuters.com/article/us-climatechange-summit-imf-idUSKBN0TQ1X820151207; World Bank, “Escalating Calls to Put a Price on Carbon,” December 1, 2015, http://www.worldbank.org/en/news/feature/2015/12/01/escalating-calls-to-put-a-price-on-carbon; Helge Lund et al., “Six Oil Majors Say: We Will Act Faster With Stronger Carbon Pricing,” press release, UN Framework Convention on Climate Change, June 1, 2015, http://newsroom.unfccc.int/unfccc-newsroom/major-oil-companies-letter-to-un/; and World Bank, “We Support Putting a Price on Carbon,” November 6, 2014, http://siteresources.worldbank.org/EXTSDNET/Resources/carbon-pricing-supporters-list-UPDATED-110614.pdf. 8 The underlying belief was that economically and technically recoverable oil was dwindling. For the conceptual progenitor of this belief, see the seminal 1956 essay by M. King Hubbert, “Nuclear Energy and the Fossil Fuels,” in Drilling and Production Practice (San Antonio and Houston: American Petroleum Institute and Shell Development Company, 1956), 9–11, 21–22, http://www.hubbertpeak.com/hubbert/1956/1956.pdf. 9 The results from an initial sample of oils from around the world can be viewed using the OCI web tool, available at http://oci.carnegieendowment.org/. OCI Phase 1 modeled 30 global oils (5 percent of current production); Phase 2 will model 75 global oils (estimated at 25 percent of current production). 10 This calculation does not include the 3.4 million barrels a day of natural gas liquids (NGLs) that are produced in the United States and refined along with crude oil to make petroleum products. Including NGLs would increase the share of untaxed emissions. For oil volume baseline data, see: U.S. Energy Information Administration, “Petroleum & Other Liquids: Supply and Disposition,” accessed February 29, 2016, https://www.eia.gov/dnav/pet/pet_sum_snd_d_nus_mbblpd_m_cur.htm. Estimates of GHG emissions from the petroleum sector, which are not transparently reported, are partially accounted for in tables 3-1 and 3-5 by U.S. Environmental Protection Agency, “Energy,” in Draft Inventory of U.S. Greenhouse Gas Emissions and Sinks: 1990–2014 (Washington, DC: U.S. Environmental Protection Agency, 2016), https://www3.epa.gov/climatechange/Downloads/ghgemissions/US-GHG-Inventory-2016-Chapter-3-Energy.pdf. 11 New unconventional oils are under development and in various stages of commercialization. They include oil buried in permafrost, rain forests, and other carbon-rich ecosystems; coal-to-liquids and gas-to-liquids technologies; retorting from oil-shale-based kerogen; new bitumen pathways; and other technologies. 12 For the number of refineries, see: U.S. Energy Information Administration, “Petroleum & Other Liquids: Number and Capacity of Petroleum Refineries,” last modified June 19, 2015, https://www.eia.gov/dnav/pet/pet_pnp_cap1_dcu_nus_a.htm; for the number of refining corporations, see: U.S. Energy Information Administration, “Top 10 U.S. Refineries Operable Capacity,” last modified January 1, 2015, http://www.eia.gov/energyexplained/index.cfm?page=oil_refining#tab4. 13 Oil and gas drilling in the United States are often reported together, making it difficult to precisely pinpoint the number of oil wells. See, for example: U.S. Energy Information Administration, “Annual Distribution and Production of Oil and Gas Wells by State From 1919-Latest Year Available,” Data.gov, last modified October 10, 2015, https://catalog.data.gov/dataset/distribution-and-production-of-oil-and-gas-wells-by-state; and U.S. Energy Information Administration, “Distribution and Production of Oil and Gas Wells by State,” January 7, 2011, http://www.eia.gov/pub/oil_gas/petrosystem/petrosysog.html. 14 U.S. Energy Information Administration, “Petroleum & Other Liquids: U.S. Imports by Country of Origin,” last modified February 29, 2016, accessed March 24, 2016, https://www.eia.gov/dnav/pet/pet_move_impcus_a2_nus_epc0_im0_mbblpd_m.htm. 15 Ian Parry, Adele Morris, and Roberton C. Williams III, eds., Implementing a US Carbon Tax: Challenges and Debates (New York: Routledge, 2015). 16 William D. Nordhaus, “A New Solution: The Climate Club,” New York Review of Books, June 4, 2015, http://www.nybooks.com/articles/2015/06/04/new-solution-climate-club/. 17 Jennifer Hillman, “Changing Climate for Carbon Taxes: Who’s Afraid of the WTO?,” Climate Advisers, July 2013, http://www.climateadvisers.com/wp-content/uploads/2014/01/2013-07-Changing-Climate-for-Carbon-Taxes.pdf. 18 World Trade Organization, “WTO Rules and Environmental Policies: Key GATT Principles,” accessed April 5, 2016, https://www.wto.org/english/tratop_e/envir_e/envt_rules_gatt_e.htm. 19 U.S. Environmental Protection Agency, “GHGRP and the Oil and Gas Industry,” last modified February 1, 2016, https://www.epa.gov/ghgreporting/ghgrp-and-oil-and-gas-industry. 20 See U.S. Environmental Protection Agency, “GHGRP 2013: Petroleum and Natural Gas Systems,” last modified October 6, 2015, map in the tab labeled “Reported Emissions (CO2e) by Geologic Basin for Onshore Production Facilities,” https://www.epa.gov/ghgreporting/ghgrp-2013-petroleum-and-natural-gas-systems. 21 National Aeronautics and Space Administration (NASA), “Polar-Orbiting Missions,” accessed March 30, 2016, http://npp.gsfc.nasa.gov/viirs.html. 22 See Christopher D. Elvidge et al., “Preliminary VIIRS Calibration for Estimating Flared Gas Volumes” (presentation, David Skaggs Research Center, Boulder, CO, May 21, 2014), http://www.esrl.noaa.gov/gmd/publications/annual_meetings/2014/slides/66-140401-A.pdf. 23 Steve Cole, Alan Buis, and Nicole Casals Moore, “Satellite Map Shows U.S. Methane ‘Hot Spot’ Bigger Than Expected,” press release, NASA, October 9, 2014, https://www.nasa.gov/press/2014/october/satellite-data-shows-us-methane-hot-spot-bigger-than-expected/. 25 Wang Tao, “Managing China’s Petcoke Problem,” Carnegie–Tsinghua Center for Global Policy, May 2015, http://carnegieendowment.org/files/petcoke.pdf. 26 See Karen McBeth, “Analysts, Aluminum Buyers Mull Impact of Chinese Petcoke Crackdown,” The Barrel (blog), Platts, October 9, 2015, http://blogs.platts.com/2015/10/09/analysts-aluminum-buyers-mull-impact-of-chinese-petcoke-crackdown/. 27 See, for example, this discussion of coke accounting issues: International Energy Agency, “CO2 Emissions From Fuel Combustion: Documentation for Beyond 2020 Files,” 2014, 54–56, http://wds.iea.org/wds/pdf/co2_Documentation.pdf. 28 Pep Canadell, “The Paris Climate Agreement – What Happens Now?,” World Economic Forum, December 14, 2015, https://www.weforum.org/agenda/2015/12/the-paris-climate-agreement-what-happens-now. 29 Michael Wayland and Melissa Burden, “Auto Industry Sets All-Time Sales Record in 2015,” Detroit News, January 5, 2016, http://www.detroitnews.com/story/business/autos/2016/01/05/auto-sales/78295542/. Particularly if we're talking about a globally integrated implementation of "smart" carbon taxes, the challenges as outlined above will be enormous. The likelihood of that becoming a functioning reality within any timeframe which will be meaningful as regards keeping temperature increases within minimally catastrophic limits would seem to be rather small. Not mentioned in the discussion is just what rates of taxation would be effective in accomplishing the desired result. Thus far, few examples of carbon pricing are featuring rates which are going to substantially affect purchasing behaviors, especially given the low underlying prices of fossil-fuel products. Since British Columbia's touted taxes ceased to be increased in 2012, emissions have begun to increase substantially there. What's more likely to do the job of preventing emissions increases - for which no plausible regulatory or behavior-modification proposal has yet been shown to be realistic - is governmental mandates for winding down production of highest-carbon fuel products' production, combined with a worldwide mobilization of the citizenry to deal with the rest of the crisis. This one is similar and about 1/3 the cost of the BHLDN It's still way above $500 but is much closer to your budget!